Left to right: James Michael Gregory, Maya Rath, Paul Petersen. Photo courtesy San Leandro Players. As one of the quintessential American comedies, Arsenic and Old Lace, with its blend of macabre humor and farce, withstands the test of time and remains hilarious to this day. As the San Leandro Players navigate this play, the small, gutsy company uses its intimate space to bring the physical humor out into the audience. The headlining characters of the show are Abby and Martha Brewster (played by Jessi Lee and Terry Guillory, respectively), a pair of aunts who delight in euthanizing lonely old men with poisoned wine. The pair functions as a two-person comedy unit that charms the audience despite their deadly hobby. Lee and Guillory shine as the Brewsters through a combination of neighborly charm, well-meaning nosiness, and naiveté over their crimes. Many other characters add to the over-the-top nonsense of Arsenic and Old Lace. Robyn Werk towers over early scenes as Teddy “Roosevelt” Brewster: Her mixture of childish glee and faux-Presidential outrage generates an entertaining performance. Contributing genuine danger to the play are Boris Karloff lookalike Jonathan Brewster (Paul Pedersen) and his partner-in-crime Dr. Einstein (Maya Rath). Pedersen does a great job channeling Karloff’s sinister horror work as he menaces the rest of the cast, while Rath lends a surprising amount of empathy to an ostensibly insane plastic surgeon. The San Leandro Players also do an interesting job in implementing the play’s foils –serious characters with no real quirks that exist to react to the others’ wackiness. James Paul Gregory plays the story’s ostensible protagonist, Mortimer; he is the standard model of foil that attempts to control the increasingly ludicrous antics of the play. Gregory manifests his role with splendid physical comedy work, leaping maniacally from set piece to set piece. Meanwhile, love interest Elaine (Natalie Moisa) serves as a foil to the foil: As she has no idea what’s happening, even Mortimer’s actions seem ridiculous to her. Moisa’s interpretation is charged with a justifiable impatience; the dual foils provide a fascinatingly multilayered style of comedy not seen in most farces. Michael Guillory’s set work is standard for the play – the aunts’ old-fashioned house, with doors aplenty for farcical antics – but it not only accommodates, but takes advantage of, the limitations of the San Leandro Players’ stage, which is very narrow and close to the audience. Objects like the corpse-storing window seat are placed at a diagonal, giving the actors more room to maneuver. Some set pieces are actually in front of the stage, so the action merges into the audience. Director Mark O’Neill extends the action across the horizontally oriented space, maintaining the actors’ visibility. 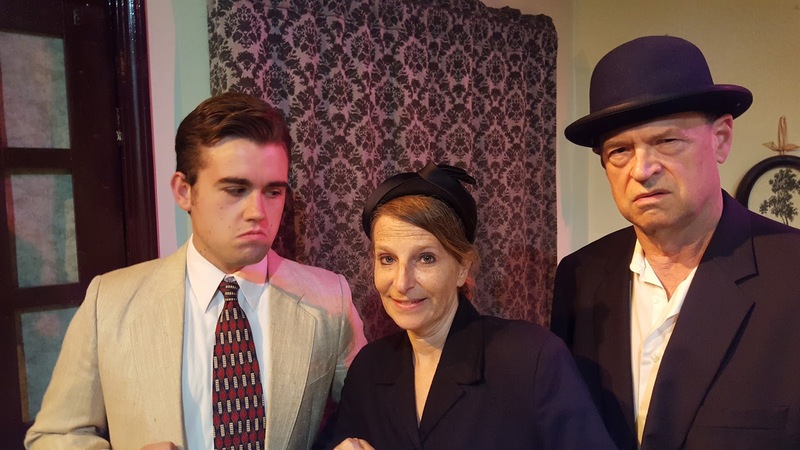 San Leandro Players’ production of Arsenic and Old Lace does justice to the evergreen American classic. The morbid jokes and slapstick comedy are just as funny as they were when the play premiered nearly 80 years ago, and the ensemble cast lends energy and talent to Joseph Kesselring’s script. Note: Natalie Moisa, who portrayed Elaine in this production, is a personal friend. Arsenic and Old Lace runs until August 13th.